Can you read Derek Sivers’ book Anything You Want (from 2011) and not want to start a company? 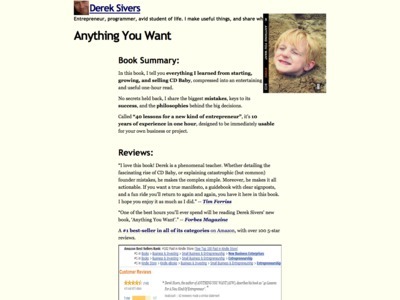 I’ve been following Derek Sivers’ blog since 2004 so I was familiar with many of the stories he’s telling in the book. But I still loved to read it. “Business is not about money. It's about making dreams come true for others and for yourself. […] When you make a company, you make a utopia. It’s where you design your perfect world. […] The key point is that I wasn’t trying to make a big business. I was just daydreaming about how one little thing would look in a perfect world. […] Never forget that absolutely everything you do is for your customers. Make every decision – even decisions about whether to expand the business, raise money, or promote someone – according to what’s best for your customers. If you’re ever unsure what to prioritze, just ask your customers the open-ended question, “How can I best help you now?” Then focus on satisfying those requests. […] If you want to be useful, you can always start now, with only 1 percent of what you have in your grand vision. It’ll be a humble propotype version of your grand vision, but you’ll be in the game. You’ll be ahead of the rest, because you actually started, while others are waiting for the finish line to magically appear at the starting line. […] Starting small puts 100 percent of your energy on actually solving real problems for real people. […] When you build your business on serving thousands of customers, not dozens, you don’t have to worry about any one customer leaving or making special demands. If most of your customers love what you do, but one doesn’t, you can just say goodbye and wish him the best, with no hard feelings. […] You need to confidently exclude people, and proudly say what you’re not. By doing so, you will win the hearts of the people you want. […] That’s the Tao of business: Care about your customers more than about yourself, and you’ll do well. […] If you find even the smallest way to make people smile, they’ll remember you more for that smile than for all your other fancy business-model stuff.